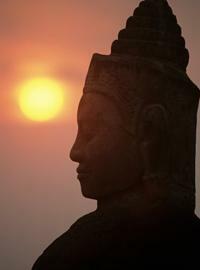 Developed from Angkor Tour 3-day package, this is an ideal journey for majestic Angkor fully exploration. Upon arrival in Siem Reap airport, met and welcome by our friendly guide, then transfer direct to hotel. Check in. At 6.30pm, a short journey to the evening venue for an excellent buffet style dinner and traditional Apsara dance show. Accommodation at hotel in Siem Reap. An early start today for a breathtaking sunrise at Angkor Wat. After sunrise and breakfast, head to the great city of Angkor Thom. Guarded by high walls and a moat we pass under the multi faced South Gate. We look first at the 350 metre Elephants Terrace and Leper King terrace with Royal Palace complex and Phiminakas pyramid. At The Bayon we will see the many stone faces - these have become some of the defining images and memories of the ancient Khmer Kingdom. Afternoon visit the jungle-like temple of Ta Prohm. The high lichen covered walls are distorted by the movement of the earth beneath. 800 years of history lie twisted and broken, with sinister root systems of huge trees enveloping doors and windows in a strangle-hold. This amazing temple is a photographers dream! Today drive to visit Kbal Spean, 50km northeast of Siem Reap or 18km from Banteay Srei. The original "River of Thousand Lingams", Kbal Spean is an intricately carved riverbed deep in the foothills of the Cambodian jungle. Visit to Banteay Srei temple (10th century), regarded as the jewel in the crown of classical Khmer Art. Then continue your visit to Banteay Samre, build in the third quarter of the 12th century. It consists of a central temple with four wings preceded by a hall and accompanied by two libraries, the southern example remarkably well preserved. Then end your visit at Rolous Group: Preah Ko, Lolei and Bkhong temple.